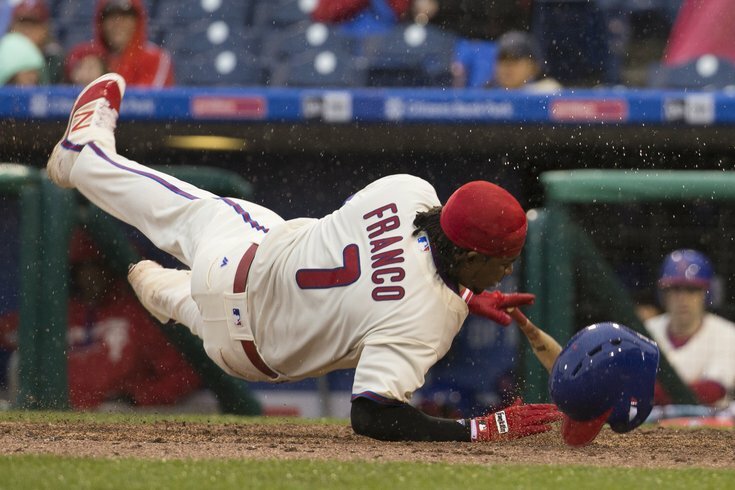 Philadelphia Phillies third baseman Maikel Franco hits the ground after a pitch that came close to his head -- and hit his bat for a foul ball -- during the seventh inning. The temperature at first pitch was announced as 60 degrees, but it sure didn’t feel that way as hundreds of fans hid under ponchos and hoodies at Citizens Bank Park on Saturday afternoon. The rain returned shortly after the start of the late afternoon game between the Phillies and Atlanta Braves. The city skyline beyond the center field fence was barely visible as a combination of fog and rain showers clouded the sky beyond the ever-shifting flags along Ashburn Alley. The drenched infield was reminiscent of Game 5 of the 2008 World Series; you half expected to see B.J. Upton slip-and-sliding his way toward a stolen base. In short: it was not a comfortable afternoon in South Philly. Unless your name happened to be Williams Perez, Ian Kroll, Jason Grilli, or Arodys Vizcaino. The Braves pitching foursome looked plenty comfy in shutting the lifeless Phillies offense down. The home team’s (disinterested?) bats managed a season-low two hits as Atlanta took their second straight game from the Phillies with a 2-0 victory. The Phillies (24-19) have lost four of their last six games. Saturday’s defeat clinched their first series defeat since the first week of the month in St. Louis. But throughout the team’s spirited seven-week run to begin the season, one ingredient has largely been missing in action from the Phillies success: offense. On Saturday, the Phillies managed to get a whopping three batters on base in the entirety of a nine-inning game. Following the loss, the Phillies moved into a tie with the Braves for the lowest run total in baseball (137 runs) and are all alone with the lowest run-per-game in baseball. The Phils are averaging 3.19 runs per game through 43 games in 2016. "We’ve known that since the beginning, known that we’re a team that’s not going to score a lot of runs," said shortstop Freddy Galvis, who was hitless in four at-bats and is hitting .234 on the season. "We have to play good defense and get good pitching. And hopefully, we’ll start swinging the bats better. ... We have to help the pitchers. We have to do a better job of hitting the ball." The Phillies have scored two runs or fewer in 15 of those 43 games (in 35 percent of their games); they are 4-11 in those games. Adam Morgan was the recipient of the latest limp offensive effort; the second-year lefty held the (usually) equally-inept Atlanta bats to two runs on four hits in six innings. Morgan’s biggest error came when he threw four straight balls to Nick Markakis after Jeff Francoeur led off the fourth inning with a base hit. Both came around to score, on an Ender Inciarte double and an Erick Aybar sacrifice fly. "Perez, I gotta tip my cap to him," Mackanin said of the Braves starter who has beaten the Phillies twice in an 11-day span. "He used both sides of the plate very well, kept us off balance, pitched a good game. But so did Morgan. Morgan didn’t lo comfortable to me the whole game but he battled to make pitches when he had to and only gave up the two runs." When you allow just two runs in six innings, you probably deserve a better fate. But Morgan, like many a Phillies starting pitcher before him this year, instead was saddled with a loss for his pitching record. The two pillars for the middle of the lineup in the last calendar year, Maikel Franco and Ryan Howard, continued their ugly runs in the month of May. They were hitless in four at-bats. Howard and Franco are hitting a combined .161 this month with 31 strikeouts in the Phillies 19 games in May. "The last two days we haven’t been swinging the bat very good," Galvis said. "We don’t have to put that on someone’s shoulders. This is a team. Nine guys go to bat. And everyone has to do something to win some games." Odubel Herrera is hitless (0-for-11) in his last three games. He has one walk in that time and four strikeouts. • Ryan Howard, hitless in his last 14 at-bats, is hitting .091 this month. Mackanin said he would start rookie Tommy Joseph in Howard's place on Sunday against Atlanta right-hander Casey Kelly in an effort to "just clear Howie's head a bit." It might be time, however, for the Phillies to make a more difficult decision in fixing the current Ryan Howard problem. • Adam Morgan rebounded from the worst start of his young career (7 runs in 3 2/3 innings vs. Cincinnati last Sunday) with a quality start. "There were some pitches that I missed," Morgan said, "but overall I felt like I improved on the outing last time so I'm just going to keep on doing that, trying to improve." Morgan has gone at least six innings and held the opponent to two runs or fewer in nine of his first 21 major league starts dating back to last year. Three of those starts (at least six innings, two runs or fewer) have come against the Morgan's hometown Braves. Morgan, a Marietta, GA., native, has a 2.42 ERA and 0.92 WHIP in four career starts against the Braves. • Chase d'Arnaud, who spent the majority of the 2015 season at Triple-A Lehigh Valley, out-hit the Phillies on Saturday, 3-2. The three hits, a double and two singles, were a career-high for the 29-year-old d'Arnaud. The older brother of Mets catcher and former Phillies prospect Travis d'Arnaud, Chase d'Arnaud had as many hits on Saturday as he had with the Phillies last season (3-for-17 in 11 games). And now, the Phanatic acting like a dog. Enjoy the rest of your weekend.